Part III’s six chapters review some of the most complex and controversial Cold War decisions, turning points, and documents of Reagan’s revolutionary integrated defense and arms control strategy and related confidential and public diplomacy. Part I’s six chapters illuminate the irreconcilable contrast between the founding faiths, institutions, historical experience and strategies that shaped the global Cold War conflict between the superpower protagonists, the United States and the Soviet Union. 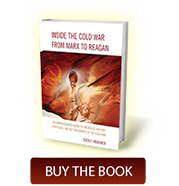 Part II’s three chapters provide an overview of key turning points and documents of Ronald Reagan’s revolutionary new Cold War “grand strategy” in his unbreakable opposition to the world’s totalitarian enemies of peace and freedom. Part IV’s five chapters focus on Reagan’s international freedom strategy to take on the Soviet ideological and imperial challenge.